Featured News Why offspring cope better with climate change – it’s all in the genes! Why offspring cope better with climate change – it’s all in the genes! In a world first study, researchers at the ARC Centre of Excellence for Coral Reef Studies (Coral CoE) at James Cook University have unlocked the genetic mystery of why some species are able to adjust to warming oceans. 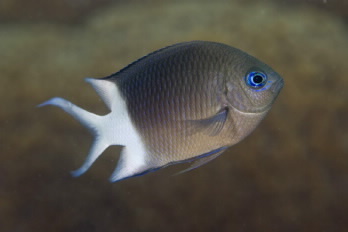 In a collaborative project with scientists from the King Abdullah University of Science and Technology (KAUST) in Saudi Arabia, the researchers examined how reef fishes’ genes responded after several generations living at higher temperatures. “Some fish have a remarkable capacity to adjust to higher water temperatures over a few generations of exposure,” says Dr Heather Veilleux from the Coral CoE. Using cutting-edge molecular tools the research team identified 53 key genes that are involved in long-term, multi-generational acclimation to higher temperatures. “By understanding the function of these genes we can understand how fish cope with higher temperatures,” explains Dr Veilleux. “We found that shifts in energy production are key to maintaining performance at high temperatures,” says Dr Veilleux. The project involved rearing coral reef fish at different temperatures for multiple generations in purpose-built facilities at James Cook University. “We then used state-of-the-art genetic methods to examine gene function in the fish,” says Dr Tim Ravasi from KAUST. “By matching gene expression to metabolic performance of the fish we were able to identify which genes make acclimation to higher temperatures possible,” adds Professor Philip Munday from the Coral CoE. The study is the first to reveal the molecular processes that may help coral reef fishes and other marine species adjust to warmer conditions in the future. “Understanding which genes are involved in transgenerational acclimation, and how their expression is regulated, will improve our understanding of adaptive responses to rapid environmental change and help identify which species are most at risk from climate change and which species are more tolerant,” Dr Veilleux says.